Getting twins or two children around at a time is always a daunting task. The best stroller for twins makes life much easier to get from A to B. We take a look at the anatomy of a good stroller, compare strollers, and give recommendations to help save you time and headaches of poor quality products. Finding a stroller that has two equal sized buckets or seats is one of the biggest challenges when it comes to shopping for a stroller for twins. There are a lot of tandem strollers on the market that offers two different weight maximums, and while this can work, they are NOT ideal for twins. The "big kid seat" will never be fully used to its maximum weight because you will need to get a new stroller with twins. What do we mean? Well if one seat has a weight max of 50 pounds and the other has a weight max of 35 pounds once your twins are 35+ pounds one of you twins will not fit in the smaller seat. Twins will always be the same size. Most designs on double strollers have a big sibling younger sibling design in mind, and these models are not ideal for twins. You lose a lot of value not being able to use the stroller to its max weight because it can only fit one of the twins. 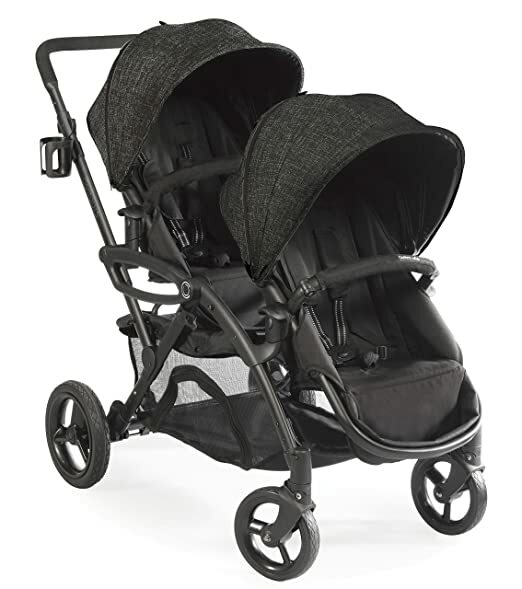 Some twin strollers that are designed to latch in your car seats directly into the stroller. These strollers work well while the child still fits in the car seat. The positive to using car seats is that you do not have to take them out of seating area they are in the car. Just moving over the car seat can save many headaches, like when your twins feel asleep during the care ride you don't have to lift them out of the seat just latch the seat into the stroller. We rate the ability to use car seats as a plus when judging the best strollers for twins. Twin strollers are somewhat limited in designs since almost all are double wide strollers. However, come brands still make jogging strollers, and others still use a box wheel setup. The jogging style of wheels on double strollers still has four wheels, but the front wheels are brought more to the center to give it still a triangular base. This setup allows for a mobile stroller allowing for the parent to tip back and maneuver quickly and with ease. The box wheel setup is how it sounds four wheels making a square shape. While your mobility goes down with this wheel formation, your base is much more stable. A more stable base means you are less likely to have any problems with tipping, weight placement, or kids affecting the ability to push/stroll. Knowing which wheel setup is best for you is critical in picking out the best stroller for twins. If you are using the stroller more for exercise and one off situations the jogging configuration is best for you. If you are going to be traveling, using the stroller every day, or more focused on safety a box formation will be best for you. There are two different types of twin strollers a double frame and full feature stroller. Double frames are designed for bassinets and car seats to fit on. Most of the manufacturers of double frames recommend you use the strollers for ages 0-9 months. Full features strollers support children from 9 months to a certain weight. It is important to note that some full feature models allow for car seats and carriers to fit into the design as well. Also included in size is the ability of the stroller to break down into smaller spaces like a car's trunk or back seat. A stroller needs to be portable so that you can use it everywhere and not just around your home. We also look at how difficult it is to break down and assemble. Weight is also a factor when determining the best twin stroller. Bulky and cumbersome strollers will be hard to lift and move around while traveling. Lighter strollers make it easier to transport and travel with the stroller. Lighter strollers are typically are the best double strollers for twins. The final piece of evaluating the best strollers for twins is the value it brings. What do we mean by value? Well, we take a look at its features and compare it to the price point. A stroller that might not have all the bells and whistles but comes at a very reasonable price will have more value than a stroller that has everything but will cost you an arm and a leg. The options elite is the perfect value for a budgeting parent. We get asked all the time what are the best cheap twin strollers? We always recommend this model, since it allows for car seats to lock into the chairs, it will last for a long time, and it will not require a change out around nine months since it is not a double frame. The entire stroller breaks down without having to remove the seats. Even though the new model is 4 pounds lighter, it still is 34 pounds total, and that type of weight can be daunting in certain situations. Especially with twins, cesarean sections are regular, and that sort of weight should not be lifted in the first couple of months. aving a kid is one of the greatest blessings in the world and that comes with the greatest of responsibility as well. Kids at their every age require lots of requirements and needs and as a parent you do your best to make sure your baby is fine. Infant car seat and Jogging Stroller is a must to have if you have a baby. To hold your baby while you are driving is either impossible if you are alone or can get extremely tiring for your partner and even for the baby over the bumpy ride. Infant car seats are available at a very fair prices which makes life much easier for you and brings the best of convenience for both, you and your baby. There is not much science involved regarding these car seats but it’s clear that not all the infant seats available in the market are as good as they are supposed to be and therefore, we are here to bring you the best infant car seats in 2018. These infant car seats have been designed in a way that they offer the best of comfort and peace of mind for your baby. No matter you are going for a long ride or a short trip, you baby is going to have and relaxed ride. These infant seats are also made for high safety standards, they are rigorously tested for all kinds of impacts and have been made sure to bring your baby the ultimate protection against any uncertain event. This not only makes you hands-free of your baby but also gives you a worry-free ride. Let us have a general comparison of the very best infant car seats in the market before we review them in detail. This amazing looking infant car seat had to make into our list of best infant car seats in 2018 for all the right reasons. It’s a rear facing very lightweight infant car seat that does not only bring happiness in your baby’s life but also bring a good lot of convenience for you. It is super lightweight which will make it very easy for you to move it around. It holds from 4 to up to 35 pounds of weight which makes it the ideal first car seat for your baby. This infant car seat features Click Connect technology which provides a secure, one-step attachment between infant car seats to all Graco Click Connect Strollers to create your own custom travel system. This installation is very easy and completely hassle-free with a convenient stay-in-car based LATCH-equipped. It also has an easy-to-read level indicator which makes the installation process even easier. It comes with 5-point harness which adjusts from the first and ensures complete safety of your baby. Simply the perfectly designed infant car seat for the most comfortable ride. A super delightful infant car seat which has been designed luxuriously from all angles to get your baby the best experience ever. It has been one of high rated infant car seats in the market and there is absolutely not a thing that this beauty lacks. Starting from its looks, it promises to make you and your baby look even better and there is certainly not a flaw in its design and construction. It has been tested thoroughly for the best safety standards to give you a worry-free ride. It fits a child from 4 to 35 pounds with an upfront harness adjustment and a 3 shoulder harness positions for better fit and longer use. A removable head pillow is given for additional support which helps a great deal to keep your baby’s head comfortable. Handle positions can be adjusted for your most convenient carry options. A canopy has also been featured which protects baby from outside elements. This infant seat is machine washable and is made to offer great durability. There is not a single reason that should stop you from buying this thing of beauty for your baby. This infant car seat is one of the best rated infant car seats in the market and it has been made flawless by all means. This seat will get your attention from the very first look as it has been made to look very stylish, precious and classy. This infant car seat does not only make your baby look better but it also makes you look good. It is worth every penny and you will admit that as soon as you put your hands on it. It has been made to last a long time and has been designed to be very light in weight. It features The SnugRide Click Connect 35 which is an amazing harness system (5-ooint in this case) based on the concept that there is nothing more important than your baby’s safety. Now you can drive worry-free leaving your baby to enjoy the ride in this utmost comfortable infant care seat. The design is gender-neutral and will work perfectly for your baby boy and/or baby girl. It has been crash tested thoroughly to have the best of safety features against all kinds of impacts for uncertain situations. Yes, this infant seat is at a whole another level of style and quality and you can tell that just by the looks of it. It comes a little costly compared to most of the other infant car seats but this little guys beats all of them in every aspect. It is one of the most reliable infant car seats available in the market and you can trust this product blindly. It offers a little more space than you would find in most of the other infant seats which brings extra comfort to your baby and your baby won’t feel congested or caged at any point. The installation is super easy with spring-loaded leveling system which provides an accurate fit in a wide range of vehicles. Bubble level indicators are given to point you out if your seat has not been installed properly. One-pull Latch tightener with force-multiplying technology has been featured to provide a secure and tight fit. 5-point harness system has a one-pull tightener. If we had to make a list of best three infant seats ever, this one would easily make the cut. It’s a truly royal kind of infant car seat which is far better than many of the infant car seats you will find in the market. This infant car seats is one of the affordable infant car seats in the market. Nothing about this seat in concerning in any way and it comes under a very fair price that will compel you to buy it. The overall look is very nice and it has been cushioned well to give your baby the experience he/she deserves. It is an ultra-lightweight infant car seat which will make it very convenient for you to hold and move it around. It fits perfectly to the babies from 4 to 35 pounds of weight. The seat itself is extremely cozy, comfortable and cushioned enough to make your baby feel all relaxed and cool. The Graco SnugRide 30 Infant Car Seat attaches to all Graco Click Connect strollers (sold separately) with a secure one-step attachment. This infant car seat has been engineered flawlessly and has been crash tested for high safety standards before making into the market. It is stylish, safe, economical and convenient. Everything you would want in one super deal! Talking about the safety of your child, it simply cannot get better than this infant car seat. You might imagine your child to be packed in this infant seat which however is not the case. It has been designed for the best air flow to keep your baby cool and fresh and also offers the best wrap and amazing fit to your baby. It is perfect for infants from 4 to 35 pounds and has been designed ergonomically which make you and your baby look better. SafeCell Impact Protection offers unmatched protection which is an integrated system of safety components found only in Britax car seats which features a steel frame for strength and a base that compresses to absorb energy during a collision. The design of this infant seat is incredibly smart and is surely one of the most durable infant car seats in the market. This is a high budget infant car seat option. At first you might not be happy with the asking price but as you get to know this little monster, you will see that the price is justified. This infant seat has been designed with intuitive innovations you can see and features that remove the guesswork. It has a SMART Secure System combines auto-retracting LATCH connectors and a visual indicator which lights up from red to green to indicate that it has been installed properly. Everything is getting smart these days and this infant seat is surely the new thing of today. The integrated side impact protection is just superb that will make sure your baby is kept at maximum protection and comfort. Another best rated infant car seat which sets the standards really high when it comes to the infant car seat market. SafeCell Impact Protection and an extra layer of side impact protection for the utmost safety. This infant car seat has been engineered impeccably and that reflects in its design and construction as well to make sure you are absolute worry-free about the comfort and safety of your child. It also features an easy-remove cover and quick-adjust no-rethread harness and head protection for ultimate convenience and safety when you’re on the road. An extra layers of side protection is given to for added safety and comfort and that might be the reason this infant car seat has been awarded as one of the very best infant car seats. Talking about the very best in business, you simply can’t bypass this beauty which lacks absolutely nothing. It is one of the bestselling infant car seats in the market and if you are thinking for taking your baby for some nice ride, this is all you need for a best wheel experience not only for yourself but for your baby as well. It features Simply Safe Adjust Harness System and has been built incredibly light in weight. You can actually hold it in your arm and walk for miles without getting any tired up. The installation is as easy as a breeze with the In Right LATCH System. An excellent first infant car seat for your baby. Try you best to dislike this infant car seat and you will never see yourself succeeded. Even if you don’t have a baby and never plan to have one, you are still going to like this baby infant car steal. This seat is one of the top dog in infant car seats market and just by the looks of it, you will know why. It has been loaded with all the luxury features offering the best of comfort and safety for your baby and yourself. If budget is not an issue, it would be a crime to not choose this infant car seat for your baby. Simple the best! Infant car seat for your baby does not come in very expensive but they also do not come so cheap that you would want them to buy again and again. One good quality infant seat should be enough for your baby for as long as he/she will need it and more. These infant seats are supposed to offer the best of comfort to your baby with the ultimate protection, if they are not offering that, they are simply worth nothing. Poor quality seats will make your baby uncomfortable and will not be much efficient against impacts. A high quality seat should be multi-layers and cushioned with proper safety and impact resistance mechanism. Our best infant car seats in 2018 fulfill all these criteria’s and are tested for high quality standards and that is why they have been trusted by the customers. Pacifiers are one of those things you have so many of but can never keep track of them. When you need one, they’re nowhere to be found, but when you don’t need one, it’s like you bought the whole store out. How Many Diapers Does a Baby Use in a Month? Having a baby is a magnificent time in your life. Whether it’s your first child or you’re adding to your family, diapers are always going to be used. The type of diaper you use is entirely up to you, but how many your baby will use, well that’s a whole different story! How to Sterilize Baby Bottles in Microwave? There are many ways to clean the bottles your baby uses, whether you do it on the stove, in the dishwasher, hand wash, electric sterilizer, or microwave. Yes, you can sterilize baby bottles in the microwave, but that’s still not a way you should heat your baby’s bottles! Hi! I'm Shirley. I’ve blogged about babies and parenting for a bit over two years, and with being a mother myself, I understand the needs and concerns you have for your children’s safety as well. It’s important. I hope you enjoy your stay with us. Find out more here! Sign up today to learn new tips and tricks to raise happy, balanced kids. TopTenStrollers.com is a participant in the Amazon Services LLC Associates Program, an affiliate advertising program designed to provide a means for sites to earn advertising fees by advertising and linking to Amazon.com. Additionally, TopTenStrollers.com participates in various other affiliate programs, and we sometimes get a commission through purchases made through our links.